I interviewed Brian Stableford about his work with Black Coat Press for issue 56 of Dark Horizons, the journal of the British Fantasy Society, published in March 2010. Could you tell us a bit about the kinds of books you've been translating for Jean-Marc Lofficier's Black Coat Press? And how many translations have you produced for them so far? At present BCP has published 37 volumes of translation by me, plus a handful of my own works, but Jean-Marc has a further twelve in hand, including four further volumes of Maurice Renard and six of J.H. Rosny the Elder. I'm now plugging away with such writers as Henri Falk and Han Ryner while waiting for the likes of Jose Moselli and Edmond Haracourt to fall into the public domain in the next year or two. I aim to keep going at least until 2014, when André Couvreur will fall into the public domain. Alongside my choices I'll be doing translations for Jean-Marc, mostly of more recent writers from whom he's obtained permission to have their work translated, although I still have a couple of Feval's Habit Noir novels to do and may well do more Feval thereafter. BCP have recently moved up to three volumes a month, which is comparable with what its companion French publisher Rivière Blanche does, and Jean-Marc will try to keep a reasonable balance between the various genres and between pulp fiction and classic works. If my eyesight holds up (it's not too good these days) I hope to be doing between twelve and twenty volumes a year for him for the next few years, as well as a modest amount of my own fiction - maybe two to three volumes - which will go to other outlets. How did you get involved with Black Coat Press? Were you working on the translations already and looking for a publisher? I first discovered the existence of Black Coat Press while looking things up online. 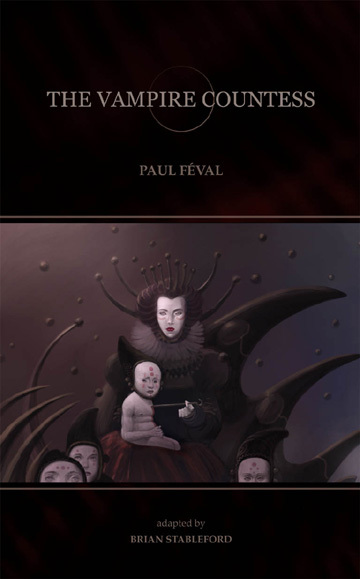 I'd already translated two vampire-related novellas by Paul Feval for another small press so I asked Jean-Marc Lofficier if he'd be interested in a translation of the Feval novel La Vampire. He said yes (he eventually published it as The Vampire Countess) and expressed an interest in doing more Feval. I was more interested in the supernatural material, while he was more interested in the crime fiction, especially the pioneering Jean Diable and the Habits Noirs novels so we came to an informal arrangement whereby I would translate any books he wanted me to do if he would publish any books I wanted him to do. Things went on from there, and I was eventually able to conceive a grand plan of doing all the untranslated classics of French scientific romance that had already fallen into the public domain or were about to do so - this was a couple of years ago, when Maurice Renard (died Nov. 1939) and J.H. Rosny the Elder (died Feb. 1940) were, as it were, looming up on the copyright horizon. I found Black Coat Press in a similar way. I was searching www.amazon.fr for more in the Volumes Lefrancq series (they produced a series of gigantic collections of writers such as Henri Vernes, Francis Carsac, Stefan Wul and Pierre Barbet in the nineties) and, disappointed to find that they were no longer publishing, I turned to Google and discovered Jean-Marc's treasure trove of French literature, albeit in translation. In both cases I was reminded of Brian Aldiss's comment that a perk of encountering alien civilisations would be gaining access to entire libraries of brand new science fiction and fantasy... How did your interest in French writing begin, and develop? I first got involved with translation when I was doing some work for a small press named Dedalus, whose proprietor asked me if I could take over The Dedalus Book of Decadence, whose original editor had let him down. I agreed before realising that I wouldn't be able to pay a translator to do any French material, and then thought "I've got O level French (grade 6) - how hard can it be?" Quite hard, as it turned out, but one improves with practice, and it was interesting - it's like a cross between writing and doing crossword puzzles. I did two more volumes of translation for Dedalus, and numerous short pieces, before the proprietor and I fell out and our ways parted. I did one volume for Tartarus and two for Sarob Press before hooking up with Black Coat, which will hopefully be the only refuge I'll need in future. One of the remarkable things about these books is the wealth of supplementary information you provide, a level of apparatus similar to and even surpassing what you'd find in a Penguin Classics volume. Are you drawing on a lot of previous work you've done, for example in your essays for Wormwood, or have these projects necessitated a great deal of original research? And are there any lost works of British and American fiction that would benefit from similar attention? I do a lot of supplementary material because I'm interested in examining the origins of the work and putting it in context - I always make a note of anything in a text that I don't understand and try to look it up, adding an explanatory footnote if it seems appropriate. I used to look things up in the London Library, but Google has made much of that sort of work far simpler. Obviously, I do draw on the knowledge I already have, which is thus subject to a continual increase, and I often do spinoff articles for Wormwood or The New York Review of Science Fiction recycling the research. Yes, I dare say that there are numerous works of antique English-language sf that would benefit from similar analysis and commentary, but most reprinters can't be bothered. If I ever get around to doing definitive collections of the fantasies of John Sterling, Walter Herries Pollock and other writers of whom no one has ever heard and in whom no one but me has the slightest interest, I'll doubtless be just as intrusive. I was interested that your credit on the cover of the books is "Adapted by Brian Stableford". As a result I initially thought that they would be rewritten, perhaps updated versions of the original works. Upon reading a couple it's clear that you've been extremely careful to stick to the originals, and outlined exactly the small departures you've made. Is the credit worded thus just for copyright or PLR reasons? I always put "translated by" on my typescripts, but Jean-Marc always alters it, presumably to comply with his "house style" (he really does tend to rewrite his own translations, and sometimes urges me to do likewise, but such alteration seems to me to be a futile deception). From the two of your books I've read so far - The Nyctalope on Mars by Jean de la Hire, and Doctor Lerne, Subgod, the first in your series of Maurice Renard translations, (both of which I thoroughly enjoyed) it's clear that English-language science fiction was a powerful influence on its French equivalent, the former being an unofficial sequel to The War of the Worlds, and the latter developing the ideas in The Island of Doctor Moreau in some rather raunchy directions. Do you think writers like H.G. Wells were aware of their devotees across the channel? Was the influence all one way? Wells would certainly have been aware of the popularity of Henry Davray's translations of his books, and doubtless duly grateful. Whether he was aware of such direct copies as La Hire's and Arnould Galopin's is difficult to determine, although Davray might well have brought Rosny's earlier works to his attention when they were reissued by the Mercure de France (Davray's employer, which published some of his translations). By the time those writers (and Renard) had started writing "Wellsian fantasies", however, Wells had given up, and had probably stopped taking much notice of other people's scientific romances. Renard and Rosny also gave up in despair, of course, believing that there would never be an audience for the kind of work they wanted to do, so their work, seen as a whole, is pretty much a study in frustration although it produced some undoubted masterpieces (e.g. The Blue Peril). In your introduction to Journey to the Land of the Fourth Dimension, you discuss how Gaston de Pawlowski conceives the fourth dimension very differently to Wells, as "the dimension of the mind, of the imagination, of art and - fundamentally, in his definition - of quality". Many French science fiction comics, for example those of Jodorowsky, Mobius or Bilal, are also surprisingly metaphysical, at least when contrasted to their British and American equivalents. Do you think there is a difference in English and French approaches to this kind of subject matter, and if so to what would you attribute that? The metaphysical bent of much French scientific romance, even in bande dessinée form, is partly due to the enduring French reverence for "le philosophe" - still reflected in the French educational system - and partly due to a number of key exemplars, such as Camille Flammarion's Lumen. The French occult revival was more elaborately entwined with literary endeavour than its English equivalent, which resulted in exotic metaphysical influences on symbolist and surrealist writers, and many French occult romances made much of their pseudoscientific elements, adding to the confusion. The authors I'm translating at present - Louis Mullem and Han Ryner - are both heavily into fanciful metaphysics, which makes the former rather hard going and the latter a trifle sententious, but I'm sufficiently intrigued by it all to make the effort seem worthwhile. About ten years ago I carried a suitcase full of books back from my honeymoon in Paris, spoilt only by the realisation on Eurostar that I had developed a bald spot. The bald spot is now a bald head and my stock of French books is running low... Can you recommend any current French writers to look out for? I'm not very familiar with contemporary French sf and fantasy, apart from the translations issued by BCP (the Dunyach volumes are well worth reading), but I've been impressed by what little I've read of Jean-Marc Ligny's work, and Pierre Bordage is highly regarded. Although we've focused here on your translations, most readers will probably be just as interested in your own novels. You mentioned two to three volumes a year - what are you working on at the moment? Personally I'd love to see more adventures of the Hooded Swan or the Daedalus, but would it be cynical to suggest this might be a good time to explore the lives of teenagers in the world of The Empire of Fear...? The books I did for DAW were very much products of their time, which is well and truly dead. I made the mistake in The Empire of Fear of ruling out any possibility of a sequel, which was probably a bad career move but one that I got stuck with, and I really think that vampires have now been thematically exhausted, at least for a while. The next work of my own fiction due for publication (from Perilous Press in March) features two Lovecraftian novellas, one of which - The Legacy of Erich Zann - features Poe's Auguste Dupin as its hero, and I'm currently tempted by the prospect of involving poor Dupin in further metaphysical adventures - at present I have Further Facts in the Case of M. Valdemar and The Return of the Xipehuz pencilled into my schedule for the summer. Thank you immensely for your time and indulgence. 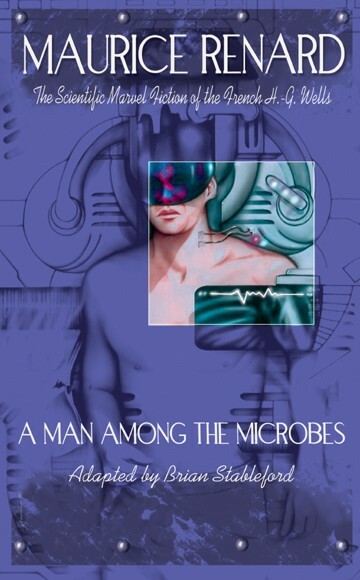 On this blog we have reviewed Brian's translations of The Nyctalope on Mars and Doctor Lerne, Subgod, both of which were highly enjoyable. BFS Journal #1 – now going out to members! Black Static #20 – featuring Theaker!